Let’s pause from our usual tendency to prattle playfully in these introductions, because this week’s subject is deadly serious. In the midst of freezing winter temperatures, imagine sleeping in a car tonight because your family was evicted from your home. How’d those Christmas stockings look hanging from the rearview mirror? The topic of homelessness is all the more heartbreaking when it involves children. It’s the sort of bad luck that can throw a kid on a downward spiral for life, through no fault of their own. Our librarian readers know about homelessness. They see the toll it takes on men, women, and children almost every day in their buildings. And a great many public school teachers know about a homeless kid or two in their classrooms. One such teacher, Connie King Leonard, is now the author of Sleeping in My Jeans, a compelling new YA novel from Ooligan Press. 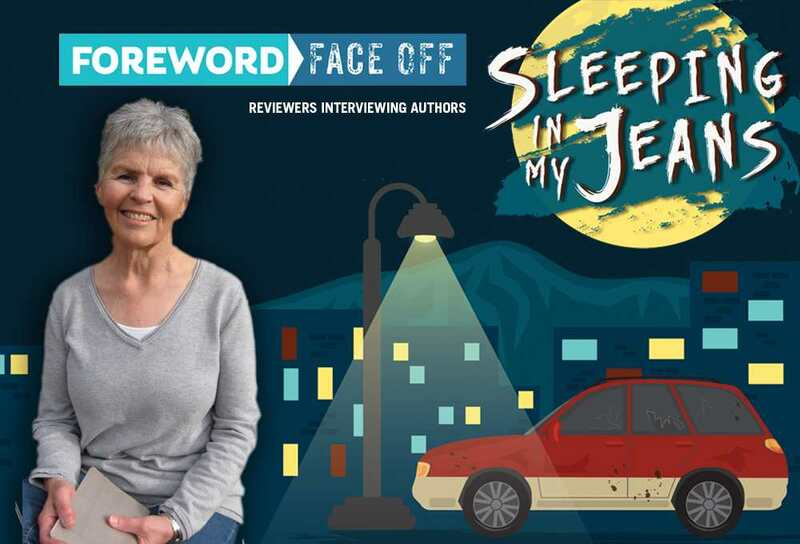 The book earned a rare starred review from Catherine Thureson in the November/December issue of Foreword Reviews, so we decided to put Connie and Catherine together to talk about the devastating effects of homelessness on families. This is sobering stuff, but our willingness to face the problem honestly is a great step towards finding a solution. What inspired you to tackle the topic of teen homelessness? Sleeping in my Jeans was inspired by a real-life incident. For most of my teaching career, I taught sixth grade. It’s an important year, because kids are learning to move from class to class and bring their supplies with them. Partway through the year a student that I call Johnny, quit bringing his science book. I was sick—so upset that I’d hounded him about a book when he had so much more to worry about. Johnny and other students inspired this story, because they come to school even though they may be living out of their backpack. The characters in the story deal with a multitude of difficulties that come with homelessness, from the big ones, like finding a safe place to sleep, to little ones that may not occur to people, like accessing technology to complete homework. How did you research all of the complex issues that come with being homeless? For research, I started with the Eugene Police Department. They were wonderful, and explained that it wasn’t illegal to camp out in a car, but they get complaints from some neighborhoods and have to ask people to move on. The [police] woman was glad my characters had a car, because an officer had just found a young woman sleeping in the park with her newborn baby. I got similar comments when I talked to people at the Eugene Public Library. They told me heartbreaking stories about teens that spend every day there. I also visited a shelter for women with children and volunteered at the Egan Warming Center, which opens churches for the homeless when the temperature drops below freezing. And as I said before, I’ve had kids in my class that were homeless. Mattie and her family run up against a human trafficker in the book and Mattie chooses to confront this individual without waiting for help from the proper authorities. This was a very dangerous decision. Why did you choose this path for Mattie rather than the safer option of letting the police handle it? Mattie does take a terrible risk by going to the garage, but she is afraid if she tells the police, they will focus on putting Meg and her into foster care and not on finding their mom. Mattie doesn’t intend to confront the mechanic. All she wants is a scrap of proof that he is the one who fixed Ruby, and then the police will have a reason to search the garage. She is also worried that the more time that elapses, the more chance she will never find her mom. Mattie is bi-racial, while her mother and sister are both white. It is always great to see more representation in YA literature, but how is her skin color a significant factor in the story? In Eugene, Oregon, Mattie’s skin color makes her stand out. In other cities, she wouldn’t be so noticeable. As the policeman in front of the library points out, she has to be extra careful, because she is so easily spotted. Friendship is a luxury that Mattie is not sure she can afford and yet a boy from school, Jack, becomes an important person in her life. Do you have any thoughts on how teens, or really anyone who may know someone struggling with homelessness, can help? It is so important that everyone, not just teens, understand that kids and families can end up houseless even though they have done nothing wrong. I use the term “houseless” here to point out that Johnny’s camper, as well as Mattie’s car, are their homes. Even the tent on the side of the freeway is someone’s home. Not everyone has the privileges some of us enjoy. Teens and adults can help their community by volunteering at places like food banks, soup kitchens, and shelters. There are countless organizations that desperately need people, and I applaud schools that make service hours a requirement. But maybe what is needed most by teens, as well as our entire country, is empathy. Are we paying attention to what is going on with the kids in our schools—our world—and doing what we can to help them? It is easy to get wrapped up in our own lives and forget that the way we live, what we say, how we act, has an impact on others. Are we kind to the kid with the raggedy jacket? Do we spend our money on material things, but vote against school bond initiatives? Everyday of our lives is a testament to our values. 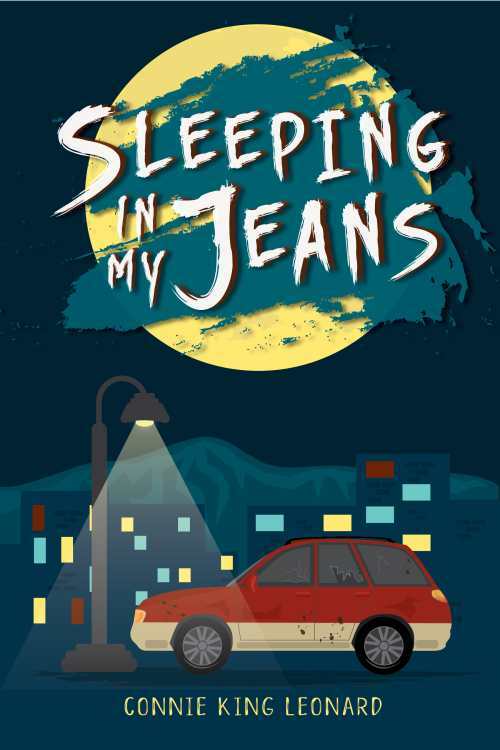 If a homeless teen happens to read Sleeping in My Jeans, what would you like them to take away from the story? I want houseless teens to know they are not alone. Each year, over 20,000 kids in Oregon and 40,000 in Washington are classified as homeless because they don’t have stable housing. Each of their circumstances is different, but people do care about them. Teachers. Friends. School counselors. Houseless teens need to be tough and strong, but those traits will serve them well throughout their lives. Teens in difficult situations need to ask for help, though sometimes it is hard to find people and resources that will steer them in the right direction. I have written a teaching curriculum for middle and high school to accompany Sleeping in my Jeans. The materials may be downloaded and copied for free from my website www.conniekingleonad.com or from Ooligan Press.